The weekly Technical Analysis is provided by Dmitriy Gurkovskiy, Chief Analyst at RoboForex. 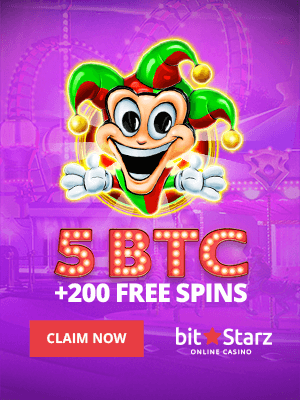 The crypto market is continuing to correct. In the short term, the prices are headed to the local lows, and then may rise to the upper correctional channel boundaries. 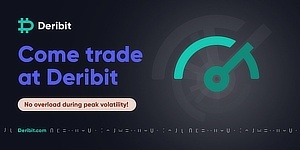 The market may be waiting for fundamental drivers that would allow the cryptos to stop range trading and form a trend. BCH is continuing to downtrend on H1. After the MACD convergence, the price went up to test the current descending channel resistance. From there, it may bounce and head to the support at 478, which is confirmed by the MACD black cross. The major resistance is meanwhile at 525, and in case it gets broken out, the price may rise to 550.50 and 565. This can be confirmed by both the support at 525 breakout and the golden cross formed by the Stochastic in the oversold area. EOS is rising on H1, while on the shorter time frames, the price is going down towards the ascending channel support at 5.77. A breakout will allow the price to move to the lower projection channel, down to 5.62, and then to 5.50, from where EOS will be likely to start rising again. The MACD has meanwhile formed a black cross, and the Stochastic left the overbought territory, which may confirm a downtrend for the next 7 days. 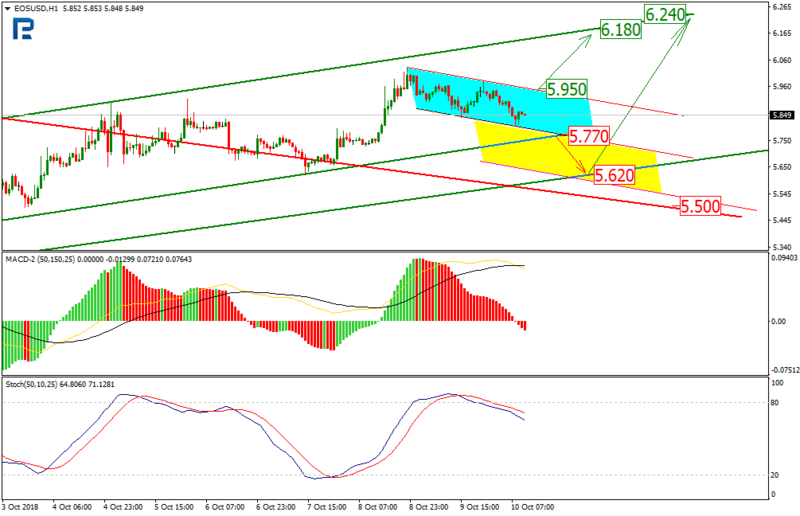 Still, the price may also break out the resistance at 5.95, which would mean it is ready to head to 6.18. Ether broke out the short term ascending channel support, which means its uptrend was just a kind of correction inside a major downtrend. The support breakout was accompanied by black crosses formed by both the Stochastic and the MACD, which is an additional downtrend confirmation. 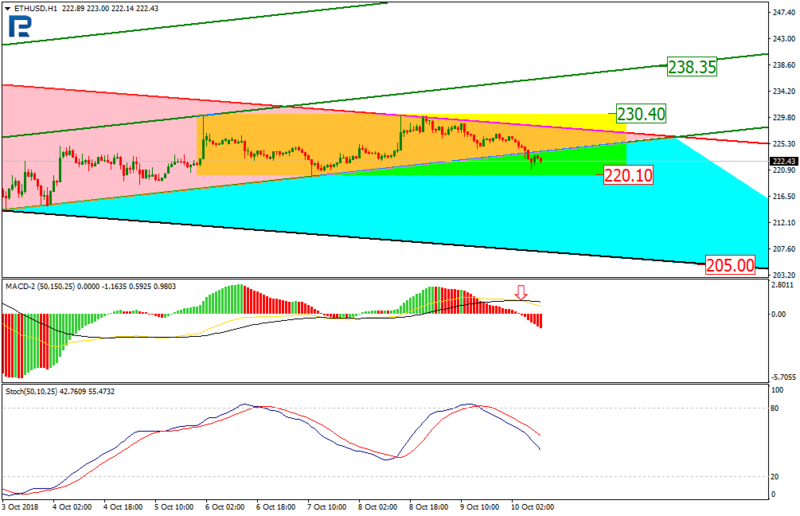 The target is now at the support (205), while this may only be reached once the local one gets broken out at 220.10. Conversely, if the price manages to break out the local resistance at around 230.40, it may then rise to 238.35. Litecoin on H4 stays in the low projection channel, while trading rangebound. 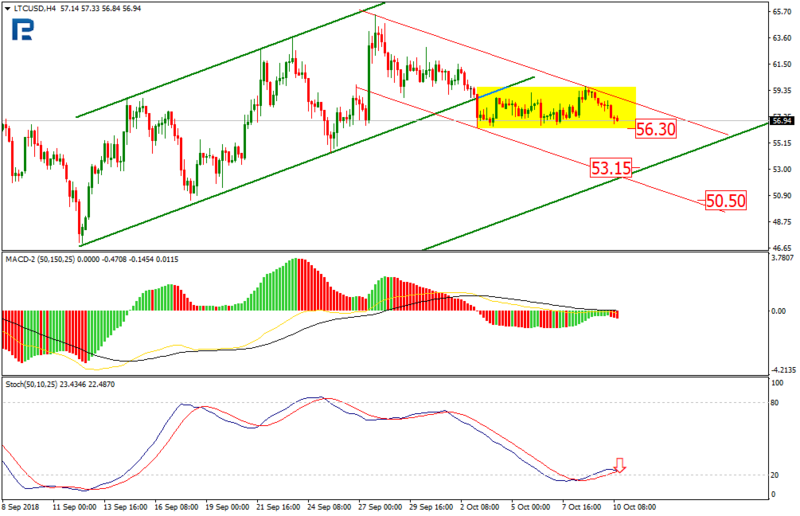 Still, the price is forming a descending trend with the target at the projection channel support (53.15). 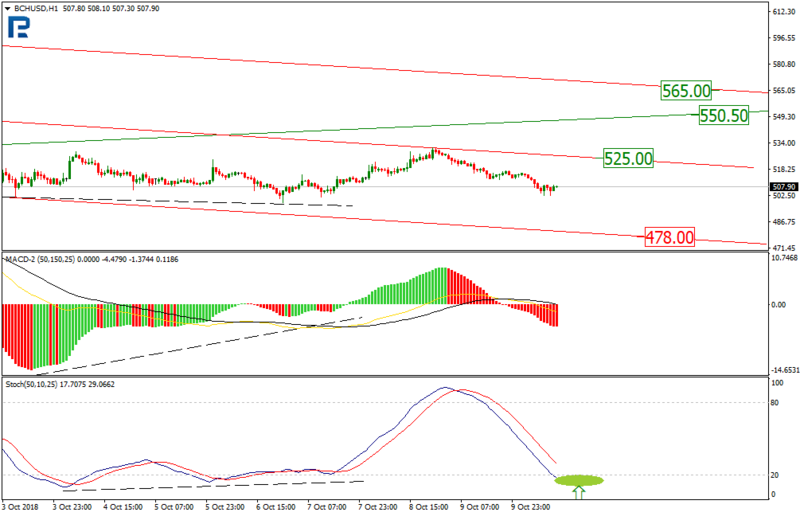 This target, however, may be reached only after the price breaks out the range support at 56.30. The MACD is going into the negatives, while the Stochastic is forming a black cross and heading towards the oversold area, which confirms the possible downtrend. Ripple on H1 is correcting, forming a range, while still being inside a descending trend. If the range boundary gets broken out, the price may reach the midterm correctional channel support at 0.4140. The downtrend reaching the target and the Stochastic being in the oversold territory will enable a convergence that will act as a reversal signal. 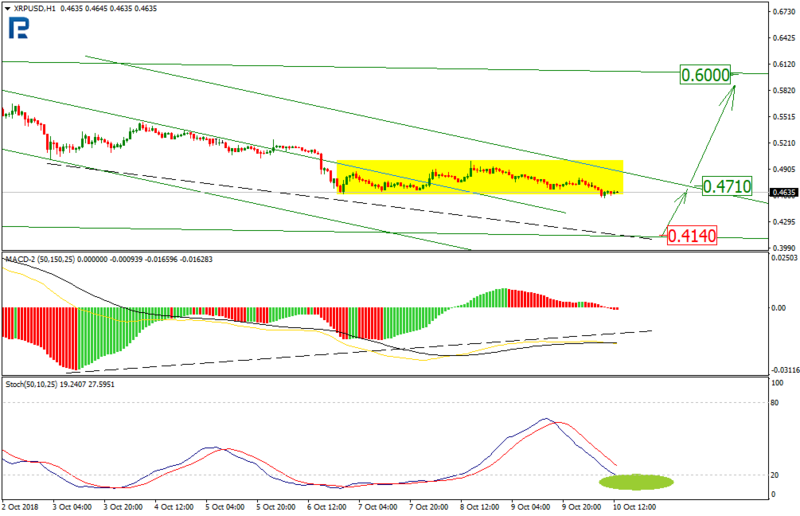 The major signal, however, will be the resistance breakout at 0.4710, the ascending trend target being 0.6000.